A recent cybersecurity alert warned that with just a moderately sized laptop and a few simple steps, anyone could bring down a big network firewall machine, using as little as 15 Mb/s ICMP traffic. This newly discovered vulnerability affects some network equipment from Cisco, Palo Alto and SonicWall, especially if they are not being operated using recommended configurations. Because of the suboptimal way in which these devices handle ICMP type 3 (Destination Unreachable) code 3 (Port Unreachable) packets, an attacker can quickly saturate the devices’ CPU. This is particularly relevant for single CPU devices. Is it relevant to my AWS environment? The short answer is No. There is no indication that the AWS networking fabric is affected at all. AWS infrastructure is designed for large scale operations (think ELB, CloudFront) and is very unlikely to be overwhelmed by this mostly-single-cpu vulnerability. Additionally, because AWS has a deny-by-default security group configuration, customer VPCs do not see traffic like this unless an administrator actively changed the configuration to allow the traffic. Now, customers can of course run their own virtual appliances (software) provided by these vendors within their AWS instances. These are all physical appliances. The virtual appliance from Cisco that customers can install in their AWS instance, the Cisco Adaptive Security Virtual Appliance (ASAv), doesn’t seem to be affected. Though there might be some vendor / machine type combination that is vulnerable, it’s unlikely. Reading vulnerability reports like these can get security and operations teams worried. 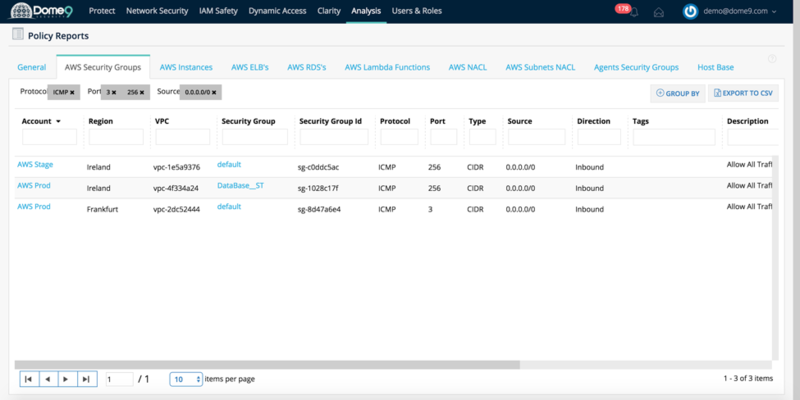 Using Dome9 Arc, you can quickly map out your network assets in a public cloud environment and check if any of them are vulnerable to a particular threat. Let me show you how. Dome9 Arc was designed to be a one-stop security platform for easy management of large public cloud environments. One of the tools in the platform is called Policy Reports which allows you to quickly generate ad hoc reports of your security policies. You instantly get all relevant security groups that allow ICMP type 3 in all you AWS accounts and all regions. Still, it is possible that these security groups are just empty or connected to private (non internet accessible) instances. We can generate a similar report, but this time focus on effective security of instances. Let’s go to AWS Instances report. We can verify that there are no public-facing instances which comply with this filter. The Dome9 Arc Policy Reports tool allows administrators to quickly check if any security groups or instances have open ports or permissive policies. It gives admins the means to configure and maintain a closed security posture.